It could be that. It could be a issue with chassis tuning. It could be tire pressure. It could be that he is just pushing the car to the very edge and that is how that car reacts. It just looks like he is working harder than I recall drivers having to work the Corvettes. The dude has serious skills because he is keeping it shiny side up on a very, very hard track. EDIT: Here is a C6 ZR1 video. He doesn't seem to have to fight the vette as much as the Camaro. I am wondering if the Camaro is just a bit more tail happy than the vette. I'm not a betting man, but I'd bet you a nickel the driver in the OP vid in that ZR1 would beat the Camero on the same track. What is the gearing of the regular ZL1 and the ZL1 1LE? The regular ZL1 has a posted top speed of 198. 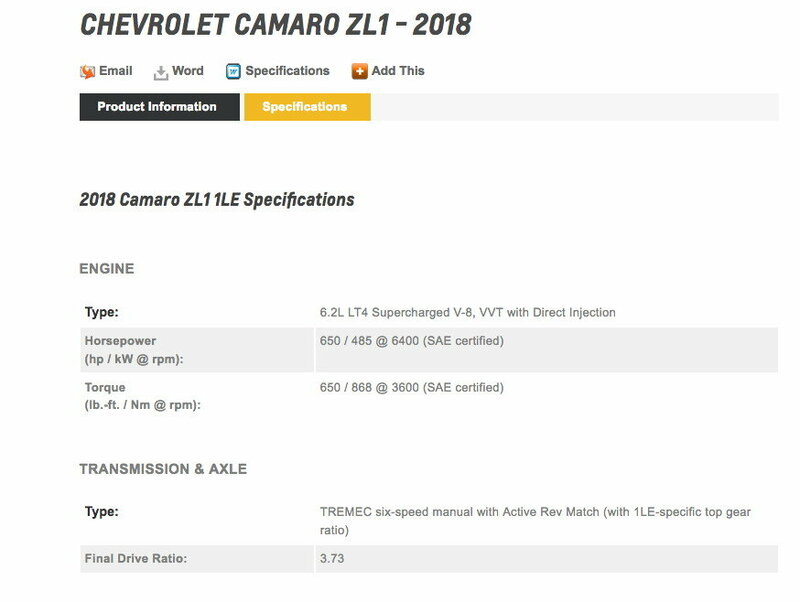 General consensus on the Camaro forum, is the 1LE version will be less than that do to the transmission gearing being different. If you look at his rpms at that speed, he has the redline to go over 200. Don't know if he has the power that high in the power band though. But he also ran out of straight away, which put an end to him gaining any more speed. Given enough room he might have made 200, but I doubt it. 99% of the time when someone is really smooth, they are simply going too slow to need to control the car on the limit. And this is a 650hp car on street tires at the ring. Smooth ain't happening unless you are driving too slow. I've had John Heinricy and Andy Pilgrim both tell me that exact thing. If you aren't on the edge every single turn, you left time out there. The transmission gearing on the ZL1 1LE does look very tight, very tight shifts. Last edited by Sky High; 06-23-2017 at 06:42 PM. I've watched a few minutes of the ZL1 and ZR1 videos and to me it seems like the ZR1 is more out of control. It certainly had just as much tire squeal yet was 10 seconds slower. I know this is subjective but I would not say there is a substantial difference in each video in regards to how much the driver has to fight their car. It was three and a half seconds slower. 7:19:63 - 7:16:04 BTW the record lap (at the time for GM) in the ZR1 was the second ZR1 video not the first and the tires in that video hardly squeal compared to the Camaro. Last edited by Sky High; 06-23-2017 at 07:48 PM. The ZR1 was on production-spec Michelin Pilot tires. The camaro was on production-spec Goodyear Eagle F1 Supercar 3R tires. I have no idea what that difference would mean on lap times. outlaps a F488 but "needs more refinement"
Watch ANY ring video and that amount of fighting is pretty standard. It's an incredibly tough track, regardless of the car. I guarantee you that if Sabine Schmitz was driving that 4 Penny, she would've bettered that time. Last edited by themonk; 06-23-2017 at 10:00 PM. Really? Well I'm looking at Sabine and it doesn't look like she's fighting the car at all, smooth as silk in fact. do you even track bro? hey haole, this tread is about performance cars on a track, what are you doing in here? Go back to picking pineapples papaya boy. Last edited by themonk; 06-23-2017 at 10:20 PM. Sabine is old and washed up. Her time passed 10 years ago. Or do not get news up there in yakfuckland? she would wipe your *** on a track......why, because she's German. Nice reach. Must have hit your 3 beer limit already. And don't worry about my beer count, have a Coke and a smile and shut the f'k up. Here's another guy who obviously has no skills. I'm sure the guys he's blowing into the weeds are smoother.